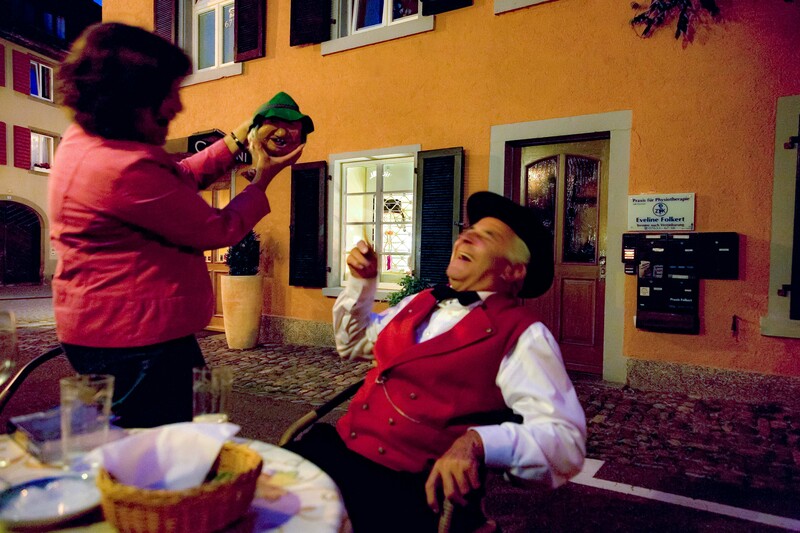 Germany, Baden-Wurtenburg Province, Original Pieter Spits When You Pull His Tie!, 2008, IMG_6096 - The man in the chair is wearing a traditional costume of the Staufen region in southwest Germany. The woman is a tourist from the USA. She bought what she called an "original Pieter." She is explaining that when you pull its tie, it spits water. She still needed to buy batteries and fill the reservoir with water. The elderly gentleman laughed continually for minutes. He laughed with the glee of a child!